Changeable Straps – The advanced curved Super AMOLED touchscreen display and interchangeable bands of Samsung Gear Fit make you look cool even during the most strenuous of activities. Customizable Themes – Samsung Gear Fit offers you a variety of background colors, wallpapers, and clock designs for you to set according to your taste. 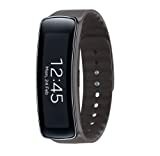 Connected Notification – Samsung Gear Fit equips you with instant notifications of emails, SMS, incoming calls, & 3rd party apps. Simple Interaction – Samsung Gear Fit allows you to easily control basic functions, such as, reject calls with messages, quick reply to messages and control alarms. Personalized Fitness Motivator – With the Heart Rate Sensor, Samsung Gear Fit gives you real time coaching to actively support and motivate you to achieve your fitness goals.